Canada’s most populous province is taking steps to become North America’s greenest economy. That’s not all — starting in July 2010, the government will begin a series of tax reductions for businesses that will total $4.5 billion over three years. “This comprehensive tax reform, which will cut the marginal effective tax rate on new business investment in half, will make Ontario one of the most competitive jurisdictions in the industrialized world for new investment,” says Ontario Minister of Finance Dwight Duncan. Ontario’s commitment to developing new business, especially in its high-tech sectors, is creating an ideal business platform for supporting world-class R&D and commercialization of green technologies and alternative energy. The Ontario legislature recently passed the Green Energy Act (GEA), an ambitious initiative that is destined to make Ontario the leader in renewable energy policy and energy conservation in North America. The GEA replaces a patchwork of inconsistent local bylaws with province-wide standards that streamline the process of site selection and approval so renewable energy projects can come online more quickly. By supporting the growth of clean, renewable sources of energy such as wind, solar, hydro, biomass and biogas, the GEA is expected to create 50,000 new “green collar” jobs in the first three years. Industries that will benefit the most include manufacturing and assembly, construction and engineering, architecture and design, education and skills training, green audits, installation and inspections, retrofitting transportation, and computer software and hardware development. By more than doubling the province’s renewable energy capacity, the GEA will attract billions of dollars of new investment for Ontario. The act also builds on the Ontario government’s earlier initiative to eliminate coal-fired power by 2014. Also a key part of the plan is implementing a 21st century “smart” power grid to support the development of new renewable energy projects, including electric cars. The Ontario Ministry of Economic Development has created a number of programs to support business development, many of which are geared toward high-tech industries, including alternative energy and new green technologies. For example, the Advanced Manufacturing Investment Strategy encourages manufacturing companies to invest in leading-edge technologies and processes. The $500 million program provides repayable loans that are interest-free for up to five years. The loans cover up to 30 percent of a project’s costs to a maximum of $10 million. The Next Generation of Jobs Fund is a $1.15 billion business incentive program that supports environmental advances in all areas of the economy, including manufacturing and energy production. In July, the provincial government will launch the Emerging Technologies Fund, which will invest $250 million over five years in green technology startup companies and other new high-tech businesses. 6N Silicon, a high-tech firm in Vaughan, Ontario, has developed a revolutionary process for purifying the silicon used in the solar power industry. 6N Silicon’s technology uses less energy and has a smaller environmental footprint compared to standard silicon-preparation methods. Once a basement operation, the company has since carried out a successful pilot project in Mississauga and now occupies a $50 million production facility in Vaughan. In May 2008, 6N Silicon received a $1.5 million grant from Ontario’s Innovation Demonstration Fund, a program that focuses on the commercialization and initial demonstration of globally competitive leading-edge technologies. The money helped the company launch its highly successful pilot project, which attracted the interest of investors. When it was time to construct a new production facility in Vaughan, Ontario provided financial support through the Next Generation of Jobs Fund, creating new sustainable jobs in a high-growth industry. The company is on course to achieve its goal of becoming the lowest-cost provider of solar-grade silicon for the solar power industry. Its technology is generating keen interest from companies in the United States and Europe that are hungry for “green-collar” jobs. The Next Generation Jobs Fund has also helped Ottawa-based Thales Rail Signaling Solutions develop cutting-edge green signaling and control solutions for the railroad industry. The province has provided a $12.8 million grant to support an investment of $85 million over the next five years to conduct green research and development geared toward upgrading and modernizing signaling technology. Mitchell Plastics is a manufacturer in Kitchener that makes decorative trim for the auto industry using an environmentally friendly process that does not rely on toxic solvents. It is receiving a $1.5 million grant from the Ontario government that will be used to improve operations and boost production at the company’s Kitchener facility to meet the growing demands for its environmentally friendly product from customers across North America, including Toyota plants in Cambridge and Woodstock. “Not only does this support help us broaden our capabilities, it also allows us to add skilled positions to our Ontario work force,” says Joe D’Angelo, the company’s president and CEO. The expansion is expected to create 32 new jobs and retain 215 jobs. Another investment in green transportation is Ontario’s partnership with California-based Better Place, a company that creates innovative infrastructure for electric cars — a necessary step for getting electric cars running on roads and highways. Better Place will build an electric car demonstration and education center in Toronto and work with the Ontario government to develop practical yet creative ways to finance the production of electric cars, improve the transportation grid, and provide incentives to create fleet services of electric cars in the private sector. Solar energy, either thermal or photovoltaic, has become the fastest-growing alternative energy technology in the world. With the GEA, Ontario has expressed a commitment to and timeline for commercializing alternative energy. Solar systems are being installed in residential and commercial buildings across Ontario — for example, Exhibition Place in Toronto has constructed a 100-kilowatt photovoltaic grid, the largest in Canada. WoodGreen Community Services, also in Toronto, hosts Ontario’s largest solar thermal energy installation, which augments the hot-water supply of a multi-unit residential building. Canada’s largest solar farm, which will produce 40 megawatts of electricity, is being built near Sarnia, with an additional 20-megawatt farm being planned at Sault Ste. Marie. Ontario is also Canada’s leader in wind power, with the country’s two largest wind farms located in the province. In fact, Ontario’s supply of wind power nearly doubled from 2007 to 2008. In November 2008, a 44-turbine wind farm near Port Alma, on the shores of Lake Erie, started operations. The Port Alma Wind Power Project will produce enough clean electricity for 30,000 households and create up to 70 new jobs. Local farmers will receive up to $300,000 per year for leasing their land. The energy generated will keep 300,000 metric tons of greenhouse gas out of the atmosphere every year — the equivalent of taking 62,500 cars off the road. The Ontario Power Authority has also awarded long-term contracts for six new green energy projects. With a combined capital cost of $1.32 billion, these projects will help the province achieve its commitment to eliminate dirty, coal-fired generation by 2014 and maximize its development of renewable energy. About 2,200 jobs and 500 megawatts of renewable power will be generated as a result of these new projects — enough electricity for more than 120,000 homes. Investments in new renewable energy projects already in place or under construction in Ontario total about $4 billion. That number is expected to grow rapidly with the GEA and its emphasis on making it easier for investors to develop and commercialize renewable energy projects. The GEA will also attract responsible companies that want to conduct operations using cleaner technologies in jurisdictions that support efforts to manage environmental footprints and energy consumption. Canada is well-positioned to become an international leader in green technology and alternative energy solutions. 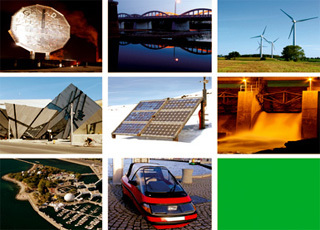 Its strategic location in North America, long-term government commitment to alternative energy generation, pro-business climate, generous R&D tax incentive programs, and advanced and diverse manufacturing capabilities make it a preferred location for green R&D and the manufacture of sustainable, alternative energy technologies and related components, service providers, and project developers.